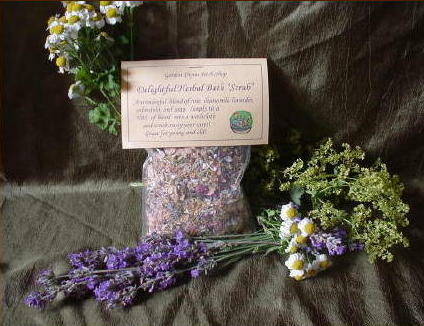 Herbal Bath Blends are a wonderful natural method to help relax and soothe dry skin, etc. They have been used for centuries before the invention of “synthetic” shampoos and soaps, etc. Our #1 selling bath blend. Relax in this wonderfully fragrant herbal bath of roses, lavender and other relaxing herbs. Excellent to use for baby bathes as well! Comes with a muslin bag and directions for use. Another delightful bath blend made with the relaxing herbs of chamomile, lavender, roses, calendula, and ivory soap. Just tie some in a washcloth, and gently scrub your cares away! This is great for those that take showers instead of baths. Gentle enough for baby and helps to relax everyone to sleep! This wonderfully fragrant herbal bath is made of lavender and roses, (to relax) rosemary, (for an astringent) and has borax added to soften the water and quicken the release of the herbs relaxing qualities. Delightful! Comes with a muslin bag and directions.